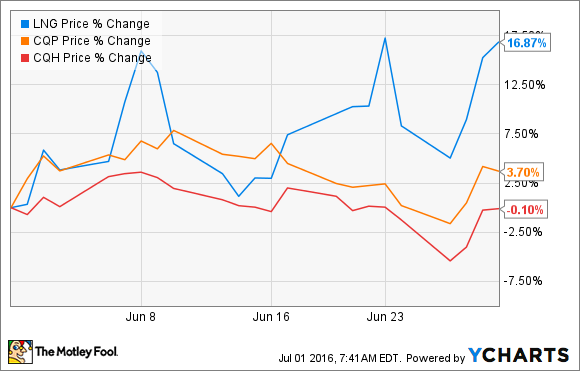 Cheniere Energy ended June up more than 16%, but it went all over the map this past month to get there. What: Shares of Cheniere Energy (NYSEMKT:LNG) ended June up more than 16% after a month that would make even the most adamant roller coaster fan a little queasy. What makes Cheniere Energy's ups and downs even more puzzling is that its subsidiaries -- Cheniere Energy Partners (NYSEMKT:CQP) and Cheniere Energy Partners Holdings (NYSEMKT:CQH) -- remained relatively stable throughout the month. So what: Cheniere Energy has been a very polarizing stock over the past year or so. The company's shares have been under the pressure of notable short-sellers such as Jim Chanos who view the company as wildly overvalued and too laden with debt to deliver long-term profits. This past 12 months also marked a notable transition as the company completed construction of one liquefaction train at its LNG facility in Louisiana. For all the years that Cheniere's stock was a bet on the idea of exporting natural gas from the U.S., it's now actually doing that. What is surprising about Cheniere's seeming volatility, though, is the entity that actually owns the liquefaction terminal -- Cheniere Energy Partners -- has seen a relatively stable ride. The one thing that seems to have ultimately fueled the most recent rally at Cheniere was a recent stock upgrade from analyst group Howard Weil. Weil upgraded Cheniere's stock to "sector outperform." It was the fifth upgrade to the company's stock by various analyst groups this year. It should also be noted, though, that some of those same analyst groups downgraded the stock as recently as a year ago. So anyone who is looking at the long-term future of this company should probably take those analyst calls with a very large grain of salt. Now what: Despite all the ups and downs of Cheniere's stock, not much has changed with the company's long-term investment thesis. The company still has strong contracts in place to sell liquefied natural gas overseas once those terminals are complete and fully operational. Until we see what the company's production looks like when running at a full clip, it's probably still too soon to judge whether the company's stock is overvalued or whether its debt load is too onerous to handle. For the investor looking well in advance, it may still be best to take a wait-and-see approach.